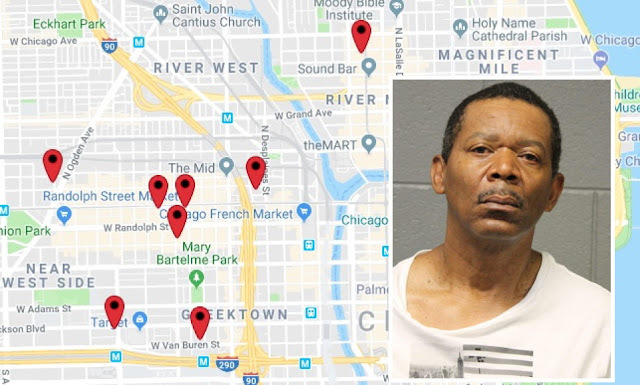 Prosecutors have charged a career burglar with breaking into eleven businesses across the West Loop and Near North to steal jewelry, computers, and personal property. In his 58 years on the planet, Robert E. Payne has been sentenced to a combined 56 years in prison for burglary. Despite being sentenced to a combined 30 years since 1998—that's only 20 years ago— Payne was off of parole and walking free when he allegedly burglarized a string of companies this spring. Cops went to the West Loop last Monday to pick up a copy of surveillance video from a data recovery business that recently reported an attempted break-in. As the officers were walking into the building, Payne was walking out. The officers say they immediately recognized him as the offender seen in surveillance footage from other burglarized businesses. They ran after Payne and arrested him at a bus stop in the 1300 block of West Van Buren. Prosecutors have charged Payne with ten counts of felony burglary and one count of felony attempted burglary. Judge John Lyke ordered him held without bail. Among the businesses Payne is accused of burglarizing in the West Loop are: a computer-aided design shop; a day care center; a shared office space; a construction company; a freelance talent agency; a law firm; a cloud migration company; a trophy shop, a data recovery firm; and a school that specializes in social justice-based education. A video production company in River North is also listed as one of his victims.